About 22 years ago, Anna Hosbein Aliaga and her?husband, Carlos Aliaga, were gifted two?baby puma cubs by rural farmers?in Bolivia. After much time spent trying to find a national park or zoo that would take the cubs, the couple decided to care for the baby pumas themselves. Needless to say, this was a very costly and slightly dangerous undertaking given that Anna was seven months pregnant with their first child. After initially nursing the cubs?in their home, the couple ended up building a zoo-like habitat on the famous Isla del Sol to house the growing pumas. The maintenance cost for these habitats quickly became prohibitively expensive for the Aliagas, and so some creative brainstorming was undertaken. Carlos and Anna ended up making a trip to the United States shortly thereafter to sell handmade artisan goods as a fundraiser for the puma habitat. The fundraising stunt raised enough money for one year of maintenance, but more was needed (pumas live about 14 years). 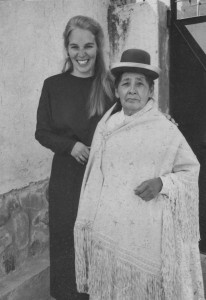 It was from this fundraising venture that AHA Bolivia was formed. Anna started talking to designers and artisans, becoming more and more impressed with the quality and variety of handiwork found throughout the country. The success of the artisan fundraising venture coupled with the skill Anna saw in the country lead to the formation of the company as a production house of knit goods, leather products and recyclable bags. A portion of the profits from the company was still applied towards the puma habitat. In the meantime, a socially responsible organization had been created; employing local artisans, creating quality handmade products and adopting a fair trade manufacturing business model.